TATS A KOOL CHALLENGE: Goodies galore! ....from my good friend Sally (from Tat's Heaven). 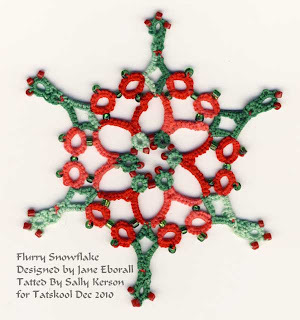 It's sister Jane's Flurry Snowflake that she designed for her Christmas Give-aways. very Christmasy in these colours. Thanks Sally for thinking of me. More goodies to show next time. Love the Flurry Snowflake - so pretty in those holiday colors. One of my favourite patterns. I actually have one, saved for ME, on my table, tatted in very much the same colours as this one. Love it. I also love seeing you post! The Flurry is a lovely pattern, and fun to tat - I made several of them as well, to enclose in Christmas cards - kept one for myself! My goodness fancy seeing this snowflake again. I made so many of them before Christmas. Actually just making, for the first time, that famous gecko named after you. My! sounds like it was a popular pattern, I never did get round to it...looks like I might have to. Gosh Sally, cant wait to see your gecko! I still haven't written up the leaf tail for it...MUST DO SO!